With Exploring Medical Language, 10th Edition, you can now master medical terms on your terms! 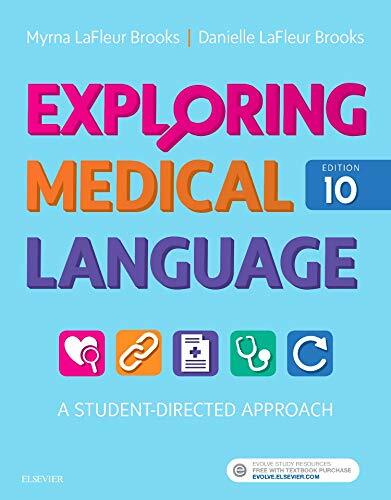 At the heart of this one-of-a-kind learning package is an innovative worktext, which enables you to gradually acquire an understanding of medical terminology by first learning word parts and then learning how to combine the parts into full medical terms that make sense. Perhaps even better is the wide range of engaging online learning tools ― tools like interactive games, puzzles, application activities, and on-the-go auditory reviews ― that come with the worktext to help reinforce your learning and help you understand how the terms are used in the professional world. In all, this is the only resource on the market that incorporates all the proven methods for mastering medical terminology that work best for today’s learners. Integrated online learning tools feature interactive games and activities, A+P boosters, career videos, and more that cater to the way today’s learners master medical terminology. If you have any questions about this product by Mosby, contact us by completing and submitting the form below. If you are looking for a specif part number, please include it with your message.